his follows the finding, announced in November 2018, of a 19-mile-wide crater beneath Hiawatha Glacier—the first meteorite impact crater ever discovered under Earth's ice sheets. Though the newly found impact sites in northwest Greenland are only 114 miles apart, at present they do not appear to have formed at the same time. "We've surveyed the Earth in many different ways, from land, air and space—it's exciting that discoveries like these are still possible," said Joe MacGregor, a glaciologist with NASA's Goddard Space Flight Center in Greenbelt, Maryland, who participated in both findings. Before the discovery of the Hiawatha impact crater, scientists generally assumed that most evidence of past impacts in Greenland and Antarctica would have been wiped away by unrelenting erosion by the overlying ice. Following the finding of that first crater, MacGregor checked topographic maps of the rock beneath Greenland's ice for signs of other craters. Using imagery of the ice surface from the Moderate Resolution Imaging Spectroradiometer instruments aboard NASA's Terra and Aqua satellites, he soon noticed a circular pattern some 114 miles to the southeast of Hiawatha Glacier. The same circular pattern also showed up in ArcticDEM, a high-resolution digital elevation model of the entire Arctic derived from commercial satellite imagery. "I began asking myself 'Is this another impact crater? Do the underlying data support that idea? '," MacGregor said. "Helping identify one large impact crater beneath the ice was already very exciting, but now it looked like there could be two of them." Although the newly found impact craters in northwest Greenland are only 114 miles apart, they do not appear to have been formed at the same time. From the same radar data and ice cores that had been collected nearby, MacGregor and his colleagues determined that the ice in the area was at least 79,000 years old. The layers of ice were smooth, suggesting the ice hadn't been strongly disturbed during that time. This meant that either the impact happened more than 79,000 years ago or—if it took place more recently—any impact-disturbed ice had long ago flowed out of the area and been replaced by ice from farther inland. The researchers then looked at rates of erosion: they calculated that a crater of that size would have initially been more half a mile deep between its rim and floor, which is an order of magnitude greater than its present depth. Taking into account a range of plausible erosion rates, they calculated that it would have taken anywhere between roughly a hundred thousand years and a hundred million years for the ice to erode the crater to its current shape—the faster the erosion rate, the younger the crater would be within the plausible range, and vice versa. "The ice layers above this second crater are unambiguously older than those above Hiawatha, and the second crater is about twice as eroded," MacGregor said. "If the two did form at the same time, then likely thicker ice above the second crater would have equilibrated with the crater much faster than for Hiawatha." To calculate the statistical likelihood that the two craters were created by unrelated impact events, MacGregor's team used recently published estimates that leverage lunar impact rates to better understand Earth's harder-to-detect impact record. By employing computer models that can track the production of large craters on Earth, they found that the abundance of said craters that should naturally form close to one another, without the need for a twin impact, was consistent with Earth's cratering record. "This does not rule out the possibility that the two new Greenland craters were made in a single event, such as the impact of a well separated binary asteroid, but we cannot make a case for it either," said William Bottke, a planetary scientist with the Southwest Research Institute in Boulder, Colorado, and co-author of both MacGregor's paper and the new lunar impact record study. "The existence of a third pair of unrelated craters is modestly surprising but we don't consider it unlikely," MacGregor said. "On the whole, the evidence we've assembled indicates that this new structure is very likely an impact crater, but presently it looks unlikely to be a twin with Hiawatha." Awaiting all the YD impact believers! And what do you have to dismiss it with? "But the areas of known volcanic activity in Greenland are several hundred miles away." This could be a reference to the hot spot that currently feeds Iceland, which historically is known to have passed from Canada under Greenland. But at that it would be old activity, I think, c.f. the Hawaii hotspot travel speed. what do you have to dismiss it with? Consensus doesn't mean much though when it's proven wrong. But for it to be dismissed so easily because of consensus goes against everything scientific method should stand for. Consensus doesn't mean much though when it's proven wrong. Which it hasn't been. So that is pretty much irrelevant. And the YD impact has been disproven? There is no proof for it. The papers that have suggested it have essentially been trashed, and the competency of the authors called into question. Care to share where they have been trashed, as I've not seen? Published in 2011, so a little out dated. I will read the paper fully later. 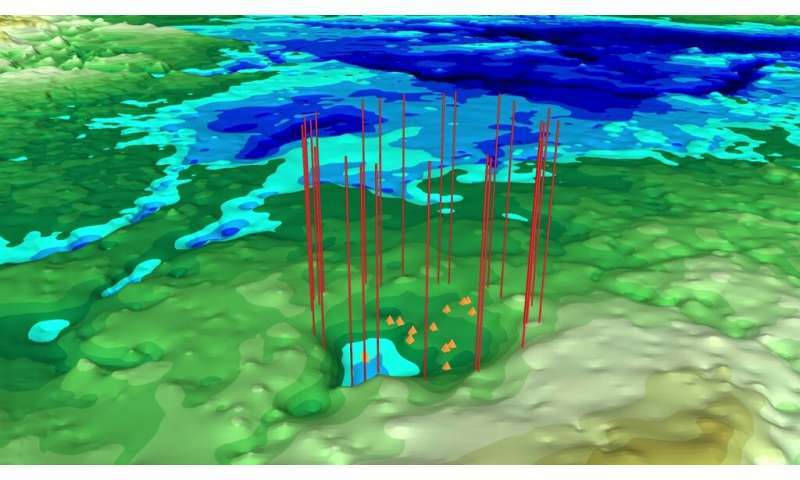 Greenland impact crater discovered in 2018 has certainly called into question the findings of many that dismissed it though. And the dating of the Greenland impacts does nothing to suggest they are YD in age. As I recall, the first one was suggested to be Pleistocene. So, anywhere from 12 000 to ~ 2.5 Ma. I'll have a read of those also. It's still entirely possible the YD impact event did actually happen. It should also be noted that the first impact site is not a million miles from an ice core site. We aren't seeing anything in there to indicate an impact at ~ 13 000 yrs. But alternatively the consensus of scientists point to the no impact data covering the time period, naturally, what else? The position you defend is somewhat analog to those who dismiss dark matter don't you think ? Why don't you look at the moon and use your limited imagination to evaluate how many impactors hit planet earth whitout leaving any trace. "NASA finds possible second impact crater under Greenland ice"
NASA couldn't find their own Azz with a GPS system and a Seeing Eye Dog ! for years...before they discovered there were 20 freaking Volcanoes under the Continent ? NASA = Never A Straight Answer ! Jesus, where do these wankers come from?